The air is thick with the fragrance of frangipani and bathed in the velvety warmth of the approaching day as I steal out before dawn, clutching my precious parcel of sticky rice. I can feel it hot against my chest as I hurry through the darkened streets, with just a few insomniac cats for company. Will I make it in time? And here they are ­– emerging like wraiths out of the morning mist, a solemn file of saffron-clad monks holding out their bowls as I kneel to make my edible offering in the ancient Buddhist ceremony of tak bat. The idea, extending back at least eight centuries, is to “make merit” – to get a kind of karmic credit by attaching myself to the spiritual life of the monks. But I must say I’m feeling pretty karmic already on my first day in this idyllic Laotian mountain kingdom of Luang Prabang. 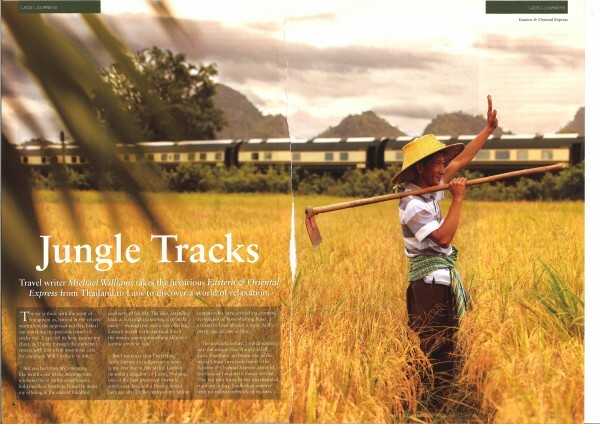 I’d arrived in Laos – not like many of my fellow tourists on some ozone-zapping plane or after hundreds of frazzled miles on a bone-shaking bus, but aboard a train. And a pretty special one at that. The morning before, I’d rolled serenely into the station near the capital Vientiane aboard one of the world’s most luxurious trains – the Eastern & Oriental Express, sister of the famous London to Venice service, making a rare foray by an international train into this tiny landlocked country with no railway network of its own. 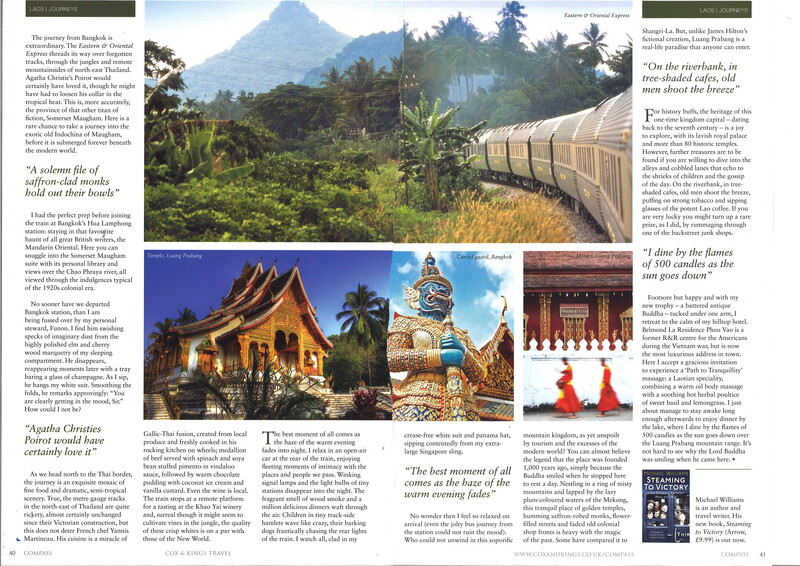 It had been an extraordinary trip up from Bangkok, as the Orient Express threaded its way over forgotten tracks though the jungles and remote mountainsides of north-east Thailand. Agatha Christie’s Poirot would certainly have loved it (though he might have had to loosen his collar in this tropical heat). But this is truly the province that other titan of fiction, Somerset Maugham. Here is a rare chance to take a journey into the exotic old Indo-China of Maugham, before it is finally submerged by the modern world. I’d had the perfect prep before joining the train at Bangkok’s Hua Lamphong station, staying in that favourite haunt of great British writers, the Mandarin Oriental Hotel. Here you can snuggle into the Somerset Maugham suite with its personal library and views over the Chao Phraya river and get in the mood for being spoiled like some 1920s expat aboard South-East Asia’s most luxurious train. No sooner out of the crowds in the station concourse, than I am being fussed by my personal steward Funon, who is busy swishing any specks from the polished elm and cherrywood marquetry of my sleeping compartment. He brandishes a tray with a glass of champagne and looks approvingly, smoothing the folds as he hangs my white suit. “You are clearly getting in the mood, sir.” And how could I not be? As we head north to the Thai border the journey passes in a fest of fine food and dramatic semi-tropical scenery. True, the metre gauge tracks on the North-East line of Thai railways are pretty rickety (promoted by the British in Victorian times, and feel like nothing’s changed since), but this does not deter French chef Yannis Martineau, who whisks up a miracle of Gallic-Thai fusion food, all made of local produce, he tells me ­– and freshly cooked in his rocking kitchen on wheels. Here is “Medallion of beef served with spinach and soya bean stuffed pimento in vindaloo sauce” followed by Warm chocolate pudding with traditional coconut ice cream and vanilla custard” – all perfectly assembled in the middle of nowhere. Even the wine is local – and before you wince – the train stops at a remote platform for a tasting at the Khao Yai winery. Surreal though it might seem to cultivate vines in the jungle, the quality of these crisp whites is on a par with those of the New World. Best moment of all comes as the haze of a warm evening fades into night. I loll at the rails of the open-air car at the back of the train, enjoying fleeting moments of intimacy with a world we can only momentarily enter. Winking signal lamps and the lightbulbs of tiny stations disappear into the night – and there’s the fragrant smell of wood smoke on the air and a million meals cooking. Children in tiny trackside hamlets wave like crazy, their barking dogs frantically chasing the rear lights of the train. Naturally, I am complete with white suit, Panama hat, extra-large Singapore Sling in hand – and all seems well with the world. No wonder I feel so relaxed on arrival in Luang (even the jolty bus journey from the station has not ruined the mood). Who could not unwind in this soporific mountain kingdom in the centre of one of the most beautiful cities in the world – a Unesco World Heritage site that has not yet been ruined by tourism, pollution and the internal combustion engine. You can almost believe the legend that the place was founded 1,000 years ago simply because the Buddha smiled when he stopped here to rest one day. Nestling in a ring of misty mountains and lapped by the lazy plum-coloured waters of the Mekong, this tranquil place of golden temples, humming saffron-robed monks, flower-filled streets and faded old colonial shop fronts is heavy with the magic of the past. Some have compared it to Shangri-La. But unlike James Hilton’s fictional creation, here in Luang Prabang is a real life paradise that anyone can enter. For history buffs, this is the joy of exploring the heritage of this one-time capital, with its lavish royal palace and more than eighty historic temples. But there’s another idyll for the more adventurous, willing to dive into the alleys and cobbled lanes that echo to the shrieks of children and the gossip of the day. On the riverbank, in tree-shaded cafes, old men shoot the breeze, puffing on strong tobacco and sipping glasses of the potent Lao coffee. If you are very lucky you might turn up a rare prize, as I did, by truffling through one of the backstreet junk shops. Footsore but happy – my new trophy of battered antique Buddha tucked under arm – I retreat to the calm of my hilltop hotel, La Residence Phou Vao, a former R&R centre for the Americans during the Vietnam war but now the most luxurious pad in town. “But I’m relaxed enough,” I protest as I’m offered the “Path to Tranquillity“ massage, a Laotian speciality to “calm the senses as the body is soothed by a hot herbal poultice of sweet basil and lemongrass and a warm oil massage under a caring touch”. Oh, go on then! And afterwards it’s on to dinner by the lake, where I dine by the flames of 500 candles as the sun goes down over the mountains. Unwound? Zzzzzzzzzz. The Buddha’s got nothing on me.